Probably most Society members will have noticed the rather fine row of new houses being built in Station Approach by Clearview Homes. Designed in a traditional style, they blend in well with the surrounding Victorian and Edwardian architecture of Station Road, Dedmere Road and Glade Road. Many of you will also know that the area where the houses have been built used to be the site of our very fine railway station before it was migrated north east and was ignominiously reduced to a mere unmanned bleak platform and a derisory shelter. The site was then developed as an office block, until this in turn was demolished for the housing development. However I suspect few will yet (but not for much longer!) know that this development has revealed a most fascinating secret! When the site was being cleared, and the old office block demolished, a long section of the original station platform was revealed, hidden by undergrowth and partly underneath an electricity sub-station. Upon inspection it was found to be in a very good state of preservation. Early discussions with Clearview Homes revealed that the company was, fortunately, planning to retain the platform along one side of the car parking area, where it forms a natural wall. It then seemed logical to propose placing a ‘history board’ on the site, similar to those on the Brewery site and Rookery Gardens. 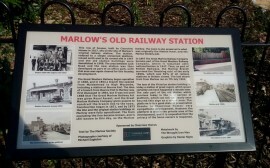 With this in mind I arranged a meeting with the Sales & Marketing Director of Clearview Homes, on Friday 14th July 2017 and showed her photos of the other history boards in the town; she was very enthusiastic and was keen to have one on Station Approach. She also confirmed that Clearview would be happy to cover the costs. We discussed location, and she suggested placing it on the railings they will be erecting. This is a most positive outcome, and credit is due to Clearview Homes for sharing our enthusiasm for highlighting the history of our beautiful town.